Large trucks, if not operated and maintained safely, can cause catastrophic damage to others on the road. For this reason, the federal government has enacted a detailed set of regulations governing the long-haul commercial trucking industry. A recent blitz of inspections has revealed, however, that these regulations are not being carefully followed by carrier companies and drivers. One organization has dedicated itself to improving the safety of large trucks on North American highways. For the past 30 years, the Commercial Vehicle Safety Alliance (CVSA) has conducted annual three-day-long inspection blitzes it labels the International Roadcheck. During the International Roadcheck, thousands of motor vehicle enforcement officers subject large commercial vehicles, such as buses, semi-trucks and 18-wheelers, to inspections at roving patrol locations, weigh stations, or inspection sites. Officers conduct one of three forms of inspection: Level I (a 37-point inspection of the driver and vehicle), II (an inspection of only the vehicle), or III (an inspection of only the driver). Over the course of this year’s International Roadcheck, held June 6-8, 2017, investigators conducted over 62,000 inspections of commercial vehicles. 40,944 of these were Level I inspections. As a result, 23% of all commercial vehicles—or, 9,398 vehicles—subjected to a Level I inspection were taken out of service after the inspection. About 27% of those vehicles had violated rules or standards on brake systems. The ability of a large truck to brake quickly is a critical feature in a large truck. Commercial trucks can weigh as much as 80,000 lbs, dwarfing an average 5,000 lb passenger vehicle, and doing exponentially more damage in a crash. 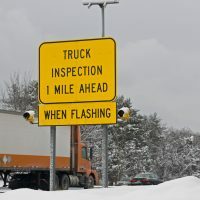 Since it already takes large trucks between 20% and 40% longer to come to a stop under ideal circumstances, it is critical that the braking systems on large trucks work properly. Over 2,900 additional trucks were taken off the road not due to a mechanical issue with the truck, but due to rule violations by drivers. About 1/3 of these drivers were found to be in violation of hours of service rules, which mandate limits on how many hours a driver may be on the road before being required to take a short break or overnight rest. These rules can help to prevent drowsy driving, which research has found to be as dangerous as drunk driving. If you or a loved one has been hurt in a crash with a big rig, semi, or tractor-trailer in Southern California, contact the seasoned, knowledgeable, and effective Antelope valley trucker lawyers at Kistler Law Firm for a consultation, in Palmdale at 661-206-6990.